Home » What is a Weigh Feeder ? 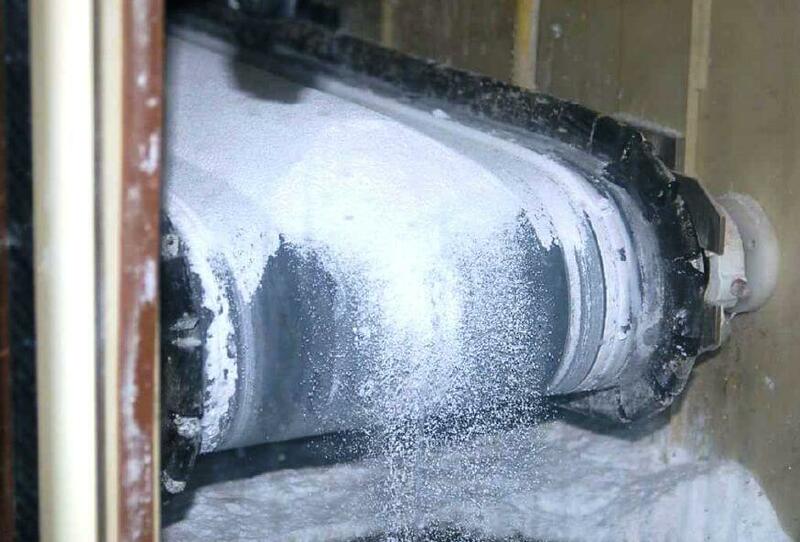 In the middle of the belt’s span (hidden from view) is a set of rollers supporting the weight of the belt and of the soda ash piled on the belt. This load cell array provides a measurement of pounds material per foot of belt length (lb/ft). The speed sensor measures belt speed in feet per minute (ft/min). This measurement, when multiplied by the pounds-per-foot measurement sensed by the load cells, translates into a mass flow rate (W) in units of pounds per minute (lb/min). A simple unit conversion (×60) expresses the mass flow rate in units of pounds per hour (lb/h). 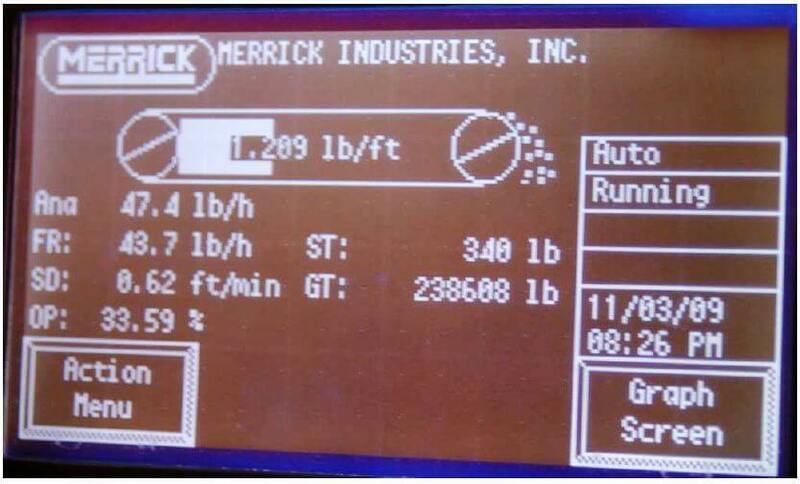 Note that the belt loading of 1.209 lb/ft and the belt speed of 0.62 feet per minute do not exactly equate to the displayed mass flow rate of 43.7 lb/h. The reason for this discrepancy is that the camera’s snapshot of the weighfeeder display screen happened to capture an image where the values were not simultaneous. 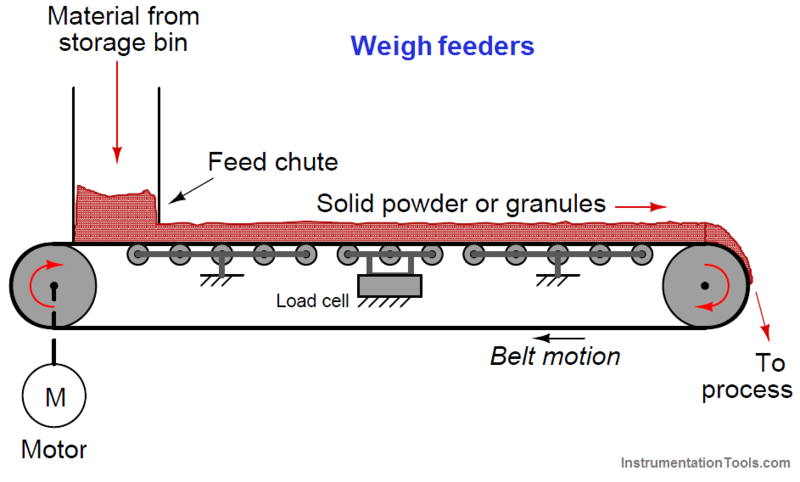 Weighfeeders often exhibit fluctuations in belt loading during normal operation, leading to fluctuations in calculated mass flow rate. Sometimes these fluctuations in measured and calculated variables do not coincide on the display screen, given the latency inherent to the mass flow calculation (delaying the flow rate value until after the belt loading has been measured and displayed).